These down alternative quilts work in warm climates like Los Angeles, and in my new colder climate home on the East coast. I keep a few on hand for guests, and when I am changing bed decor these solid quilts give me color ideas to work out themes. And the great thing is the washing/drying is easy and they last for a long time. Bring bold color and style into your bedroom decor with this trendy comforter set. Crafted from soft polyester for a lightweight but warm design, the reversible comforter and matching shams are machine washable and versatile. The set is available in a variety of contrasting colors, and is embellished with box stitching that keeps the hypoallergenic fill in place for comfort and all-season warmth. This comforter is not of poor quality... IT HAS NO QUALITY. The stitching is unraveling off the quilting! Poor quality fabric, no quality stitching. Avoid this product/ Overstock should be ashamed of offering such a shoddy product and then making you pay for a return shipping label?!! Really??? Overstock used to be better than that!! I love the way this looks, and the comfort. It was a gift for my very tall husband. Once I made the bed up, I realized that is was several inches shorter on all sides. It's king sized, for a king sized bed, but on the bed looks more like queen sized. Too much of a pain to return it, so we will just be more careful in the future. Other than that, it is wonderful! This comforter is light weight, soft and very fluffy. The shams have buttons to hold the pillows in place and the material is super soft!!! I was very disappointed in the quality as it has a permanent 15 inch long bump in the quilting very thin and is a full not a queen. I misread the measurements of the comforter, and it turned out to be only 86 inches from top of the bed to the bottom. So I sent it back in for something that fits my bed better. It is, however, lovely - great colors and construction! 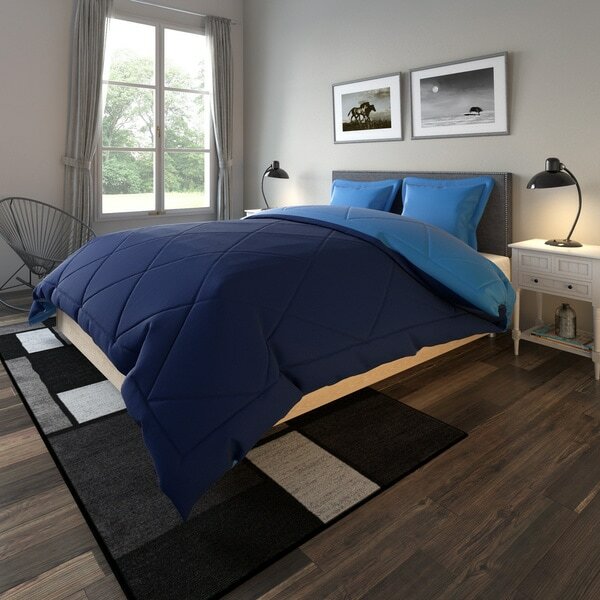 I liked this comforter because of the bright blue color on the reverse side of the navy. However that blue is actually a Carolina blue not at all like the bright blue shown. It is a nice soft comforter though. I did keep it anyways. One more thing, I bought the king size for my queen size bed & it fits nice. Glad I didn't buy the queen size. This comforter set is what I expected for the price I paid. Very light but cozy, kind of thin fabric, color did not excite me, but very serviceable. Fits my king-size bed just fine - just remember it is not square, but rectangular, and the wide side of the rectangle is for the width of the bed. Washed it 3 times and no sign of damage or unstitched seams. Very comfortable. Still fluffy. Love my bedding ! So soft ! Excellent quality ! Highly recommend! Read reviews they said queen to small so got king and it to big but dealing with it. Returned. The color was off and cheap looking. Love it this was a great comforter set my kid loves it and it goes with everything blue this is sturdy and warm! The Comforter set was a perfect pick for my nephew as he starts his Engineering career. This product is Ok. The zipper on both shams broke quickly which does not look good. The color looks nice and the comforter is warm. I would not recommend. "What color are the shams that go with the choc comforter"
"Are there sheet sets of same brand that coordinate?" Not that come with the comforter but I am sure you can find some on the same web site that will match. "Wondering the difference between the navy/regatta and the other blue/stone. They both look the same in the pictures. Which one is darker blue? I'd prefer a true navy. " "Are the burgundy/black pillow shams reversible or available in burgundy?" Hello delprado, the pillow shams for the burgundy/black option do not reverse to burgundy on the opposite side. Sorry for the inconvenience. Thank you for shopping with us! "What is all included ?" This 3-piece comforter set includes one comforter and two pillow shams (one in the twin size).